“Thank you, Omaha. That’s so nice, thank you. Go, Mavericks!” President Obama says. 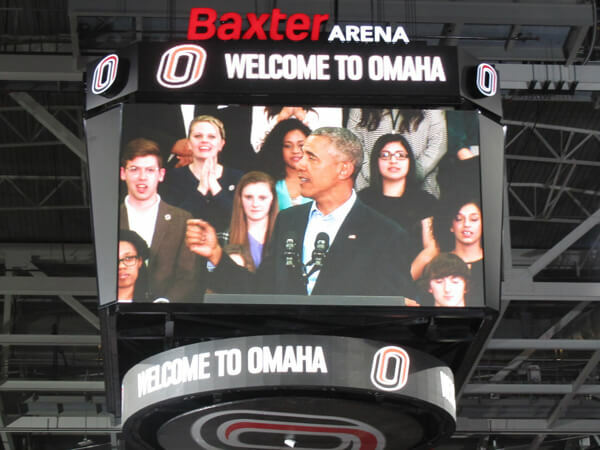 The commander-in-chief was welcomed last Thursday by more than 11,000 people who were crowded at UNO’s Baxter Arena. People anxiously waited outside in line for hours to see the President on his visit to the metro area. UNO distributed tickets at various locations two days before which had sold out last Monday. For 22-year-old Ana Gavia waiting to see President Obama at the Baxter Arena was not only a privilege but what she says, “is historic!” Gavia, a first generation college student, says she can identify with the President because of his minority background. “I believe he is not only a role model for African-Americans but for all minorities or people that had to struggle and are achieving something. Mayor Jean Stothert and Governor Pete Ricketts greeted President Obama at Offutt airbase. Congressman Brad Ashford accompanied the President throughout his visit. “The plane ride was great and we got to sit and chat about some great things,” Ashford said. The President then paid a visit to a Papillion teacher’s home and even met personally with the family of fallen police officer, Kerrie Orozco while in Omaha. Both were invited to attend the anxious crowd at the Baxter Arena later in the afternoon. President Obama visited Omaha after his state of the union address on a two-day tour to show what his administration has done while he has been in office. He chose Omaha for its low unemployment rate, even in the face of the recession throughout these past seven years. “We’re in the midst of the longest streak of private sector job creation in history, 14 million new jobs, around 40,000 right here in Omaha and the surrounding areas. Our national unemployment rate has been cut in half; it’s down to 5 percent. It’s below 3 percent here in Nebraska. So our starting point has to be things are not terrible if your unemployment rate is at 5, and here in Omaha it’s below 3.” President Obama says. His themes throughout his talk at the Baxter Arena heavily reflected his State of the Union address, which was televised the previous night. “Now, as I said last night, families on food stamps did not cause the financial crisis. We’ve got to reform our broken immigration system, but immigrants are not the reason wages haven’t gone up.” President Obama says. “I think he is a remarkable character, who hasn’t always been given the chance to do what he wants to,” Paige Joerger says, a student at UNO. “Not only will it draw in people to our school and community but his visit has enriched everyone’s lives and it has been a once in a lifetime opportunity that I will remember forever. The President finished his speech by speaking about the resilience of the American people and the need to continue our legacy by being an example for the world. He says, “That’s how America leads. That’s the strength of our values. That’s the power of our example.